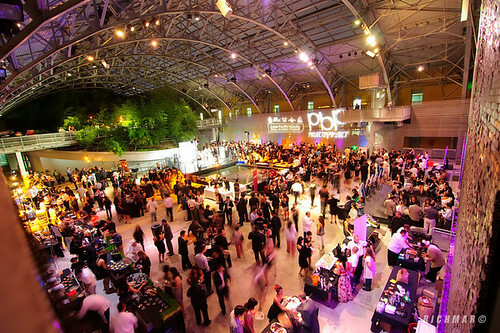 This year will be my first time attending Project by Project’s main, annual fundraising event called Plate by Plate – but there are plenty of hot names and a great cause on this ticket to warrant going. Your ticket will directly benefit our Asian American community at large as Project by Project partners with an underserved non-profit each year to help them reach their goals. The names serving up this year’s delectables that have personally piqued my interest include: Chef Laurent Quenioux of Bistro LQ, Chef Ricardo Zarate of Mo-Chica, Chef Kevin Meehan of Cafe Pinot, Chef Amar Santana of Charlie Palmer at South Coast Plaza, Chef Anthony Zappola and Pastry Chef Shannon Swindle of Craft, Chef Eric Greenspan of The Foundry on Melrose, Thi & Nguyen Tran of Starry Kitchen, Chef Chris Behre of Gonpachi, Chef Suzanne Tracht of Jar, Susina Bakery and Valerie Confections. 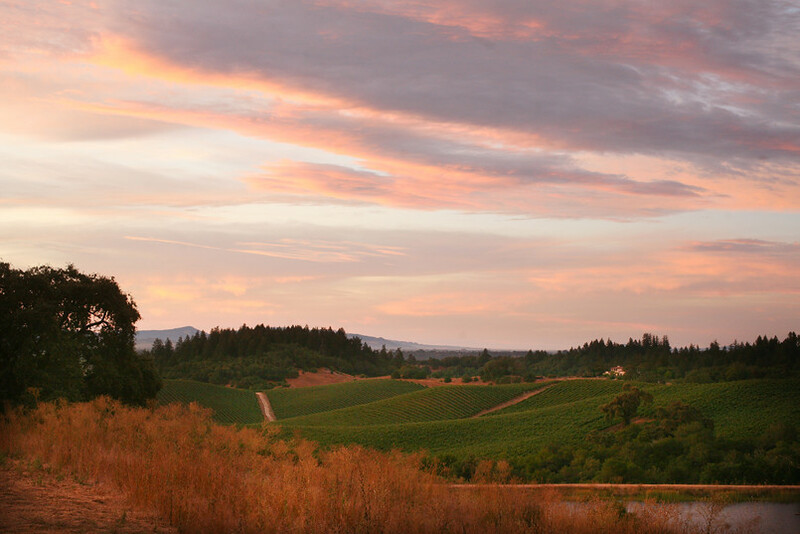 Throughout the event, you’ll get to sip wine from 25 different wineries with your food, enjoy a taiko performance andÂ see Aziz Ansari play sous chef. Bid in the silent auction on generous packages from restaurants and vendors all over the city. Either way, I hope to see you there. I wouldn’t miss this one! *Parking entrance is located on Figueroa St. between Exposition Blvd. and Martin Luther King Jr. Blvd. I always knew that South Coast Plaza was one of the premiere places in Southern California to shop. Until recently, I’d never the opportunity to find out that it’s also a destination to eat. I, along with a few other bloggers, were invited by the PR company representing the South Coast Plaza restaurants to go on a tour, extending overnight, of a few of them. Our first stop was Hamamori – a Japanese restaurant headed by James Hamamori. While I wasn’t sure what to expect, I was pleasantly surprised – mostly by the sushi dishes that came out. 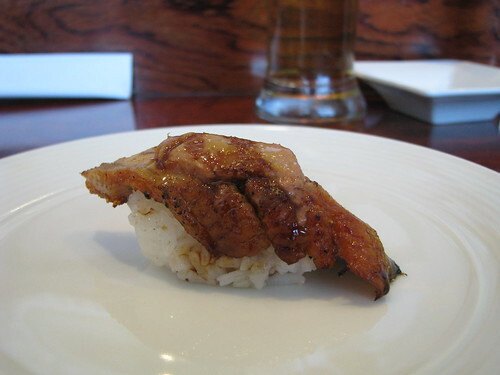 Above is freshwater eel sushi with foie gras and a torch taken to the top layer – rich texture and taste. Also good was a yellowtail sushi prepared with lemon salt and topped with chili paste, which actually had me wishing there was a bit more chili paste on the sushi as I tend to prefer spice in each bite if given the choice. 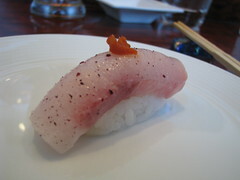 A scallop version also prepared with lemon and shiso salt but topped with caviar, instead, was also good. The appetizers were also respectable. 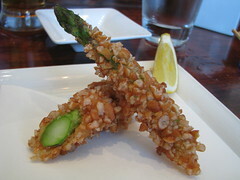 There was a dish of chopped, seared albacore prepared with soy, vinegar and fried green onions which seemed rather typical but a creative option was an asparagus tempura but the dish – instead of being simply battered and fried – was encrusted with bits of fried japanese crackers. A heated stone option is also available if sizzing, fine slices of kobe beef dipped in sauce fits your fancy. Chili salt, apple sesame and steak sauce are paired for the dunking. The first was a sort of unremarkable dipping option (tasted simply as salt – not much chili) while the apple sesame reminded me of a Korean BBQ marinade. The steak sauce was a tad smokier yet still sweet. The experience of cooking one’s own meat on the table, in any case, makes for an interactive experience fit for family outings and dates alike.